Thanks to YOU, the State Legislature has Passed the PBCC’s Dense Breast Notification Act. Now on to the Governor’s Desk! Posted By PA Breast Cancer Coalition on October 24th, 2013 at 11:30 am | 2268 comments. Great News! 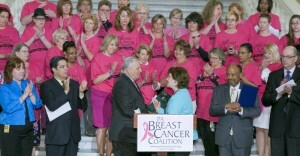 The state legislature has passed the PBCC’s Dense Breast Notification Act. This legislation, sponsored by PA Sen. Robert Mensch, will require radiologists in Pennsylvania to notify women of their breast density. From here, the bill goes to PA Governor Tom Corbett for his signature before it becomes law. Thank you for contacting your state lawmakers to support this important legislation. Dense breast tissue increases a woman’s risk of being diagnosed with breast cancer at a later, more dangerous, less treatable stage. Many women with dense breast tissue do not know they have it, and a mammogram may not be enough to detect a lump or irregularity in the breast. The Dense Breast Notification Act will change that. 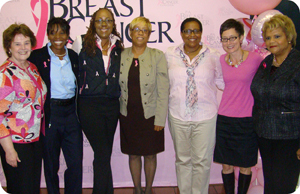 Each day, 32 women in Pennsylvania are diagnosed with breast cancer. The PBCC’s mission is to help find a cure for breast cancer and to improve the quality of breast cancer education, research, programming and outreach in the state. The Dense Breast Notification Act can assure that every woman who receives a mammogram is informed of her breast density along with the potential risk factors and additional screening options available. Thank you for turning awareness into action and saving lives! 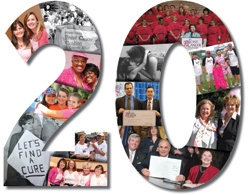 Celebrating 20 Years Strong: Thank You for a Successful 2013 PA Breast Cancer Coalition Conference! Posted By PA Breast Cancer Coalition on October 24th, 2013 at 11:29 am | 1253 comments. We could not think of a better way to celebrate 20 years of turning awareness into action than to spend a day learning about the latest developments in breast cancer alongside nearly 1,000 survivors, caregivers, advocates, and researchers. The Conference began with a star-studded Pink Party featuring celebrity hosts and a premiere of the 2013 Penn State Milton S. Hershey Medical Center’s Pink Glove Dance video. Special thanks to our hosts Nell McCormack Abom, witf; Sue Campbell, WINK 104; Tammy Miller, Tammy Speaks, LLC; Alicia Richards, abc 27; Lesley Ridge, PBCC Board of Directors; Earl David Reed, 105.7 The X; and emcee Dave Marcheskie, abc 27! The PBCC was privileged to honor world-renowned researcher Dr. Dennis Slamon with the Potamkin Research Prize, Pink Ribbon Awardees Mindy Gray and Jeanne Schmedlen and Shining Light Awardee Westmoreland Walks. We would love to hear about your experience at the Conference. Click here to take the Post-Conference survey. A special thank you goes out to our 2013 Sponsors. Without you, we could not offer this fabulous event! Thanks to you, we are 20 Years Strong. Please join us next year for the 2014 PBCC Conference on Monday, October 13 at the Harrisburg Hilton! Posted By PA Breast Cancer Coalition on October 23rd, 2013 at 12:01 pm | 1272 comments. The Pennsylvania Breast Cancer Coalition is offering a wide range of experience in all aspects of non-profit operations and programming, public relations and event management through assisting the Executive Director, Community Outreach Director, Program Coordinator and other PBCC staff as needed. This position has flexible hours. It can be for 20-28 hours per week and pays $10 an hour. This is a temporary position funded through October 31, 2014. Posted By PA Breast Cancer Coalition on October 11th, 2013 at 8:45 am | 2654 comments. 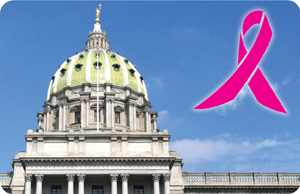 We are just days away from the PA Breast Cancer Coalition Conference in Harrisburg! We hope you will join us in celebrating our 20th Anniversary with a day of learning, networking and fun! The PA Breast Cancer Coalition Conference offers educational workshops covering the latest in breast cancer research, treatment and advocacy. This year’s event will begin with a special session by 2013 Potamkin Prize Awardee and world-renowned researcher Dr. Dennis Slamon who discovered the life-changing treatment Herceptin. His work has saved the lives of thousands of women. Kick-off the Conference with us in style at this year’s Pink Party! We’re rolling out the pink carpet for a celebration of breast cancer survivors, Grassroots Partners and PBCC volunteers. The reception is free to the public and will feature celebrity bartenders, hors d’oeuvres and music. 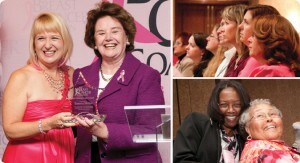 Help us celebrate the PA Breast Cancer Coalition’s 20th Anniversary with the largest conference crowd yet! Conference registration will be available online through Monday, October 14th at 5:30pm. Registration will be also be available at the Hilton beginning at 7:00am on Tuesday, October 15th. Action Alert: Tell Your State Representative to Support the Dense Breast Notification Act! Posted By PA Breast Cancer Coalition on October 11th, 2013 at 8:44 am | 2034 comments. We’re almost there. The PBCC is working on a crucial piece of legislation scheduled for a full House vote next week. Senate Bill 358 would require mammographers to notify women with dense breasts. Women with dense breasts have an increased risk of being diagnosed with breast cancer at a later, more dangerous stage. The State House decides next Wednesday. The House of Representatives needs to know the importance of this legislation. We have created an advocacy toolkit with more information including video, sample letters and details on dense breast tissue. Call your state representative and tell him or her to support legislation that would save lives in PA! If you’re a person who was diagnosed with breast cancer at a late stage because of dense breast tissue, please contact us at 800-377-8828 or email us at Info@PABreastCancer.org. Why should you support this legislation? Watch the VIDEO here. Download our digital advocacy toolkit here. Posted By PA Breast Cancer Coalition on October 11th, 2013 at 8:37 am | 1338 comments. The PBCC will celebrate life, courage, hope and dignity of Pennsylvania breast cancer survivors beginning October 24th at Geisinger Medical Center in Danville, Montour County. 67 Women, 67 Counties: Facing Breast Cancer in Pennsylvania features photos and messages of strength from women across Pennsyvania who have battled this disease. We would love to see you there! Join the PBCC, Geisinger Health System and the PA Department of Health for a special kick-off opening reception for the exhibit Thursday, October 24th at 5:30 p.m in Geisinger Medical Center’s Henry Hood Center for Health Research. To RSVP for this event, call 800-377-8828, ext. 3050 or email Kristen Snoke, Community Outreach Director at Kristen@PABreastCancer.org. Following the reception, the photo exhibit will move to Geisinger’s Hospital for Advanced Medicine. For complete details on Geisinger’s photo exhibit kick-off event, click here.